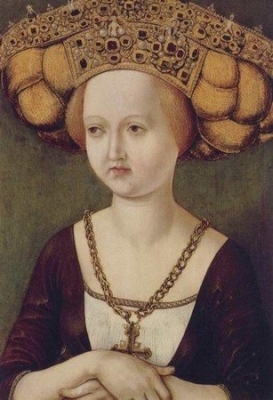 Margarete von Pommern was the daughter of Bogislaw V Herzog von Pommern.1 She married Ernst I 'the Iron' Herzog von Österreich, son of Leopold III Herzog von Österreich and Viridis Visconti, in 1392.1 She died in 1407. She was also known as Zimburg. [S16] Jirí Louda and Michael MacLagan, Lines of Succession: Heraldry of the Royal Families of Europe, 2nd edition (London, U.K.: Little, Brown and Company, 1999), table 125. Hereinafter cited as Lines of Succession. [S16] Louda and MacLagan, Lines of Succession, table 78. [S16] Louda and MacLagan, Lines of Succession, table 125.